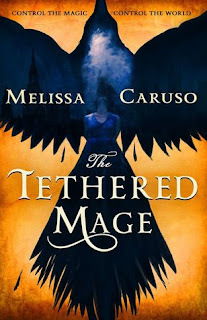 The Tethered Mage by Melissa Caruso. Orbit, 2017. Paperback. 480 pages. I first came across this book back in July when it was mentioned by a fellow book blogger and I was immediately taken in by both the cover and the setting of a 17th-century inspired fantasy Venice. 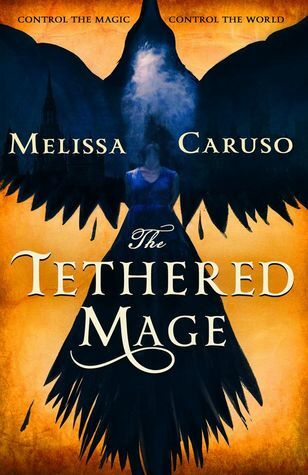 The content of The Tethered Mage was just as enticing as I hoped and introduced an alluring new fantasy world and magic system. This book starts off with action that throws you right into the basics of the current state of magic and politics in Eruvia. If you're confused, just hang on because all will be explained. Lady Amalia Cornaro, soon to inherit her mother's place in the all-powerful Council of Nine--rulers of the Raverran Empire--ends up unexpectedly attached to a previously unknown mage known as Zaira. The two end up in what is known as a Falcon/Falconer relationship in which an individual mage's magic is controlled by a non-mage, which is all the detail I'll give regarding the setup of this story (if you don't already know, I'm a firm believer in finding out the details for yourself--it's a much better experience that way). As mentioned, we the readers are thrown right into the middle of the magical and political machinations of this world, and I found myself a bit lost in some of the beginning discussions among the Raverran elite. Fortunately, the most important information that you need to know for the plot is mentioned again later in a more elaborate and understandable manner. Amalia herself is rather stubborn, but this seems to be a common trait among book protagonists and I didn't find it to be too overbearing for once. In the end, I came to appreciate Amalia's tenacity and willingness to do what she feels is right, whether or not it is what she is 'supposed' to do, despite her follow-the-rules personality. Zaira, unlike Amalia, is much more rebellious and is unafraid to speak her mind. Honestly, I didn't much like Zaira's character in the beginning, but she quickly grew on me and became one of my favorite characters. I also loved her dog. Amalia's mother is also one of those characters that you don't necessarily like, but she sort of grows on you by the end. Also, I found Prince Ruven to be a particularly intriguing character whom I look forward to reading more about in the second book. The world-building of this new fantasy was well-done and has made me interested to continue the series and find out more about it. What intrigued me the most was the fact that individuals with magic are used as the 'army' and the those without magic are the ones in charge and able to control those without it. I found it to be quite a nice change from the situation of many other fantasy worlds in which the noble/elite usually have more of the magical power and abilities. I thought that Caruso did a good job portraying both sides of the scenario, with Amalia coming from the powerful side and Zaira coming from the magic end. This division allows the reader to see how Zaira viewed her position and felt as if she were forced to be a slave to the elite and is not pleased with being made to use her powers for their wishes, whereas Amalia has only ever known the opinion that this is a positive relationship for both mages and non-mages alike. I appreciated this dichotomy and how it contributed to the overall storyline and development arc of the characters. It was also interest to read from a protagonist's view who doesn't have magical powers. For those wondering, there is a small romantic subplot, but it isn't overdone nor does it take away from the plot. Overall, I've given The Tethered Mage four stars! I had a great time reading it and I highly recommend it to anyone who loves some good fantasy.